As the news settles in that IBM has ejected its entire MarTech/CX business technology portfolio, now is a good time to try to suss out what this means for the marketplace as a whole. I think there are five key lessons for customers, and that we ought view other major suite vendors in a new light as well. Despite rebranding much of the portfolio under the Watson moniker, it didn't seem to move the sales needle at all. As it happens, IBM never really Watsonified much of this portfolio, but that begs the question: why not? It could portend other AI disappointments in this space. It's hard to align moving pieces across a suite. Big Blue wanted to sell MarTech stack, but there was little coherence across the product direction and too much services work putting it all togther. Note that other major suite vendors suffer from the same problem. IBM built or acquired some on-prem solutions and then built or acquired some PaaS and SaaS offerings. They labored to support both hybrid solutions as well as a path to the cloud, but it's hard to pull that off in a fast-moving space. Adobe, Salesforce, and Oracle face similar challenges to vary degrees. Native cloud micro-services much easier and cheaper to maintain, patch, and upgrade. If ever one was needed, this should be a wake-up call. To be sure, for "platforms" anchoring your tech stack that require heavy customization and extension, a cloud PaaS model may still make sense. But less so every day. 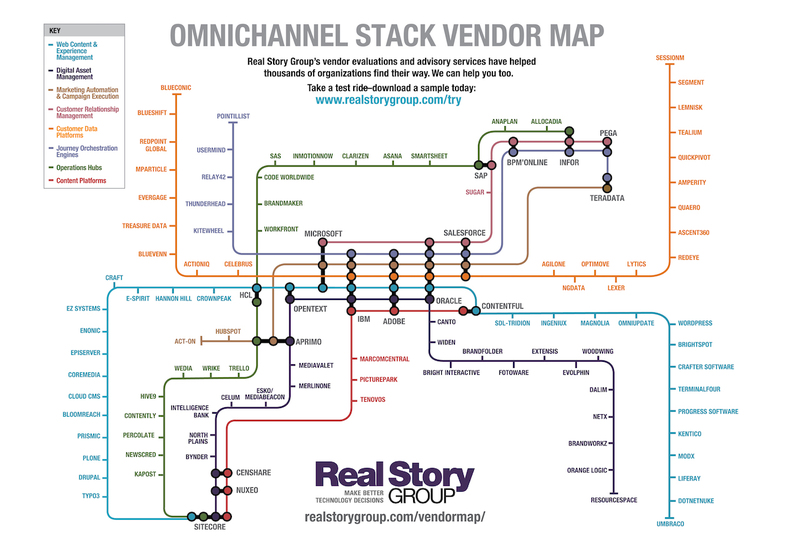 It's worth looking at the other big MarTech suite players. Adobe, Oracle, Salesforce, and (to a lesser extent) Microsoft should refrain from any happy dances this week. IBM's exit removes a legacy competitor, but their peskiest competitors — mostly pure-play vendors — remain, and Big Blue's failure may expose broader weaknesses across the suite strategy. Consider some of the key marketplaces. Major name players (including whatever Centerbridge assembles from the IBM kit) can lay claim to the city center. But most innovation still happens on the periphery, where the typical vendor, while smaller, will have less legacy drag holding them back. Adobe, Oracle, and Salesforce all struggle to align and integrate their different products and stacks, leading to consistent (if not always loud) customer frustration. Their AI/ML efforts still feel mostly unproven beyond test cases. They have all doubled-down on creating complex systems for the engagement tier, at a time when enterprises need to invest lower in the stack for true omnichannel customer experience. 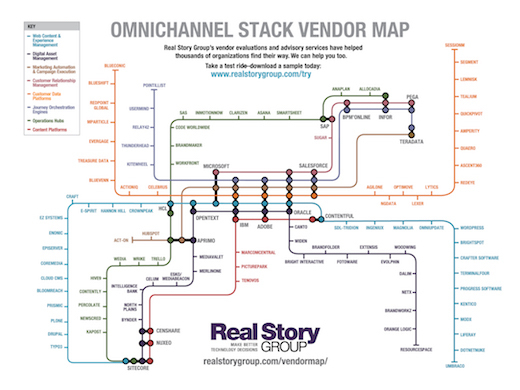 Review a fast-paced briefing on the New Omnichannel Stack Reference Model. As a stack owner or CX platform manager at your enterprise, you don't face immediate next steps — unless you're a significant IBM customer, in which case you should probably ignore rosy projections from the new owners and reconsider your strategic options. The rest of us just need to keep a close eye on the behemoth players in this space, and watch carefully how they address some of the same shortcomings that made IBM capitulate. "I was really excited to preview RSG's Digital Marketing Technology evaluations. It's great to have a resource that explains what vendors really do, rather than what they say they do."